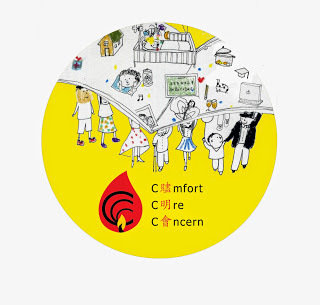 The Comfort Care Concern Group (CCCG) was established in 1987 as a non-profit organisation. Their aims are to promote comfort care to the terminally ill and their families, and well as the bereaved. CCCG is an agency member of The Hong Kong Council of Social Service, and receives funding support from The Hong Kong Jockey Club Charities Trust and The Community Chest of Hong Kong. Befriending Visit to Hospital Wards: Comfort Care Concern Group provides volunteer befriending visits to hospital wards. During the visit, their volunteers send regards to patients, arrange small group activities like handicraft making. Sometimes the volunteers do daily shopping for the patients and have tea at Chinese teahouses with patients together with medical staff if needed. They also organise functions during the festivals like Mid-Autumn Festival and Christmas time. Bereaved Volunteer Service : Bereaved volunteers are a group of people having the experience of losing their loved ones. After either individual or group counselling, they change their roles from being help actively helping others by sharing their experience and feelings. While the bereaved volunteers deeply understand the newly bereaved, they are compassionate peers for the newly bereaved clients. The development of this service is aimed at providing the clients with more tailor-made solutions in handling the situation and reducing their lonely feelings during the bereavement period. Home Visit Services : Some terminally-ill patients may stay at home for recuperation while other patients may be arranged to reside at the Homes for the Elderly. To continue the social support and care to patients, CCCG volunteers pay visits to the patients’ homes regularly after their discharge from hospitals. The objective of home visits is to soothe the feelings of anxiety and loneliness of the patients. Volunteers also take care of the living conditions of these home stay patients after their discharge from hospitals such as accompanying the patients for shopping and medical follow up. Volunteer home visits help bridge the connection between hospitals and society for discharged patients. Home visit services are provided through referral from hospitals or organisations. Priority of home visits is set according to the needs of the patients. Funeral Support Service : Funeral is a ceremony the bereaved use to memorialize their lost loved ones. However, not many of them know how to handle the funeral procedures. Although publications of these procedures are available from the government and different relevant organisations, volunteers accompanying the bereaved certainly help to soothe the anxiety of the service users by providing on-site emotional support. As CCCG is aware of the need of funeral support services, we offer training to a team of Funeral Support Volunteers to help the bereaved. They are well equipped with techniques on bereavement caring and knowledge on funeral procedures. To ensure comprehensive funeral support, their work is closely supervised and followed up by our social workers. If you are interested in volunteering for one or more of the above volunteer services, please follow this link and send them a message, or call CCCG at 2361 6606. *All volunteers are required to complete relevant training courses and to pass entrance interviews before joining CCCG volunteer teams.